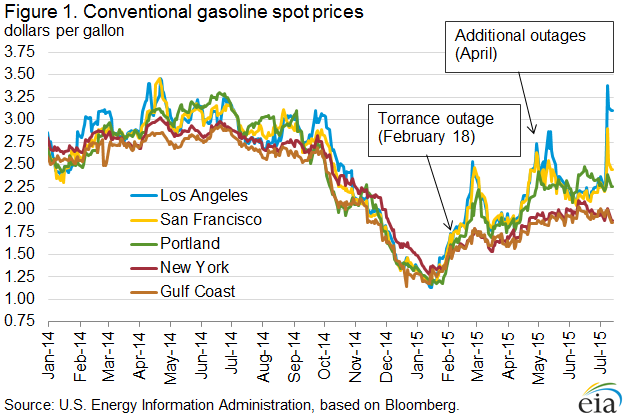 California gasoline prices are again in the news, recently meriting headline in the Energy Information Administration's (EIA's) publication This Week in Petroleum, from which the graph above is taken. At present California gasoline is averaging about $3.88 a gallon, with some prices as high as $4.30 to $5.49 a gallon. This contrasts to a national average price of $2.76 a gallon. The primary reason for high California prices is a February 2015 explosion at ExxonMobil's Torrance refinery that caused extensive damage. Regulators will not allow ExxonMobil a temporary exception to use older-technology emissions control equipment, and repairs are predicted to delay the refinery's restart until late 2015 or early 2016. Because California requires gasoline to meet specifications much stricter than those of other states, its market is isolated by regulation as well as geography. Even if the state had pipeline access to giant Gulf Coast refiners, gasoline for and from other parts of the country usually cannot be sold in California. California gasoline prices also are higher because it has a) higher gasoline taxes, b) higher electricity costs, and c) additional refinery costs to meet California's cap and trade law. Nonetheless, like the predictability of the annual spring Catalan bid for independence from Spain, hearings are underway in California by those suspicious of gasoline price gouging. The simpler explanation? Laws of supply and demand continue to work. As a forward-looking example of those laws, relief for California is on the way in the form of gasoline imports from Asia and Europe. I, Laura Starks, do hereby certify that, to the best of my knowledge, the views and opinions in this research report accurately reflect my personal views about the companies and their securities as of the date of this report. These viewpoints and opinions may be subject to change without notice and Starks Energy Economics, LLC will not be responsible for any consequences associated with reliance on any statement or opinion contained in this communication. Members of Starks Energy Economics, LLC are long the stock of Valero and the limited partnership of Tesoro.